"A very comfortable cottage for romantic holidays for two"
Enjoy a relaxing stay in Oak Tree Cottage a traditional stone built, beautifully refurbished self-catering holiday cottage, located on the Sleat Peninsula. 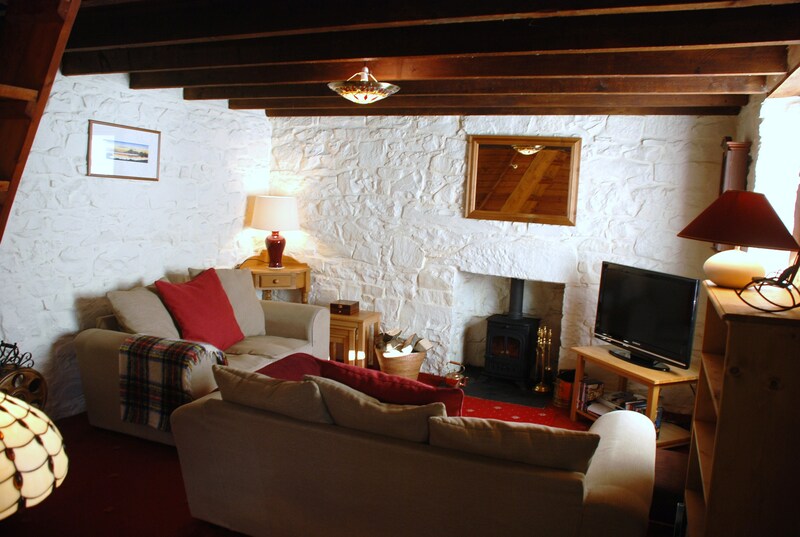 The cottage has a WOOD BURNING STOVE as well as its own picturesque garden with private parking area. Within walking distance enjoy fabulous views out over the Sound of Sleat to the Scottish mainland and the Inner Hebridean islands of Eigg and Rhum. Please note that the cottage has a short but steep open wooden staircase to the upper floor(see photos). There is a handrail but please bear this in mind when booking. The mystical and stunning Isle of Skye or in Gaelic Eilean Sgiathanach is a land of stark volcanic rock formation and breathtaking scenery. The Cuillin Mountains form some of the oldest mountains in Europe and are considered to be the most dramatic mountain range in Britain. Skye is an idyllic location to explore the romantic Hebridean Isles and their turbulent Celt, Norse and Scottish heritage all of which have influenced the evolution of this magical region. Oak Tree Cottage is situated in the village of Ardvasar on the Sleat Peninsula of Southern Skye, known as 'The Garden of Skye', due to it's abundance of trees and greenery and wonderful woodland gardens. The area is a riot of colour all year round, with striking carpets of bluebells in May and glorious rhododendrons in June and a myriad of wild flowers decorating the countryside throughout the seasons. There are many beautiful woodland and shoreline walks in the area, where you may catch a glimpse of local wildlife, including golden eagles, red deer, seals and otters. The village benefits from a hotel/pub and at nearby Armadale you will find the Armadale – Mallaig ferry and a selection of craft shops, garage and shop with filling station as well as the famous Clan Donald Centre and Museum of the Isles. There are a range of hotels, bars and restaurants throughout the Sleat area. The larger village of Broadford is approx 15 miles away and here you will find more local amenities including a supermarket, 24-hour filling station, bank, Post Office as well as a selection of hotels, bars and restaurants. Skye is the biggest island in the Inner Hebrides and travelling there has been made much more convenient by the introduction of the modern toll free road bridge connecting the island to the main land at the Kyle of Lochalsh. However for those looking for a more traditional crossing the ferry from Mallaig is still a most enjoyable option. Yes, you can still sail over the sea to Skye! 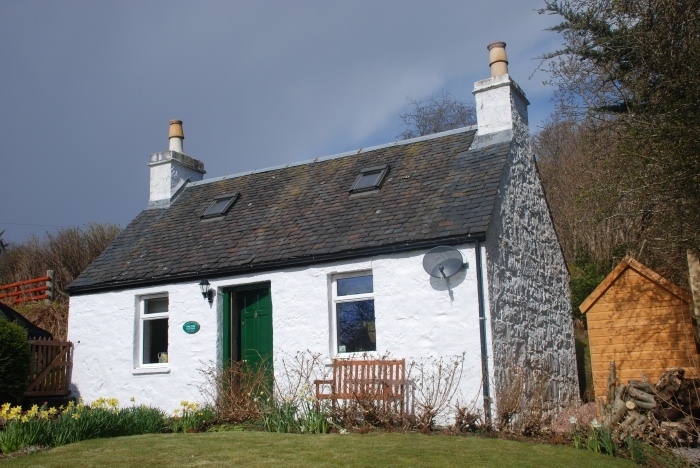 Oak Tree Cottage is just a 5 minute drive from the ferry to Mallaig and the Scottish mainland. Prices are inclusive of bedding and towels together with full electric heating. Traditional stone built cottage with garden and off road parking. Picturesque location with stunning views of Eigg, Rhum and the mainland just a short walk away. Sorry no pets and no smoking.